Post-clean up, the recovery and rebuild continues for many businesses across Calderdale, and the community are still coming out in force to support the stricken businesses. The Dusty Miller which re-opened its doors in Mytholmroyd last week had support from local landlords sharing equipment, breweries donating beer, and even Dominos offering pizzas on the opening night. Local bands turned out to celebrate the opening night and The Drum Machine caused quite a stir along Burnley Road as their beats rang out in the night sky. 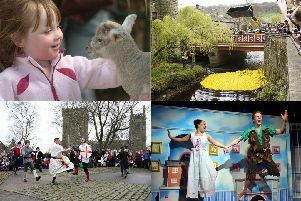 The crowdfunding effort led by Business for Calderdale, aims to capitalise on this collaborative approach, as 103 of them are working together to promote a campaign to raise funds for their own businesses, and also gain promotion for the whole area. Skills have been willingly shared across all businesses, and the social media expert for Silly Billy’s Toy Shop was able to share statistics with those involved in the campaign. Shrewdd PR, Wright Angle Marketing and Event Coverage are all local businesses that have donated time and skills to the campaign, plus many skilled individuals creating video and offering ‘rewards’ to sell. Besides the businesses actually involved in the campaign, others have also contributed, such as the West Yorkshire 4x4 Volunteers who are offering a 4x4 off-roading experience as part of the fundraising effort. One of the most popular rewards is The Hebden VIP Card, which was the brainchild of Amanda Horsey of local business Elwood, which sells vintage clothing. Rather than offer a ‘reward’ by herself, she has collected a number of them from across the town and this card now offers discounts for a year across more than 20 retailers and restaurants. This reward alone on the site has generated over £3,000 for the fund and local shop-owners are happy to be a part of it, as it will bring more trade to the area generally. Hebden Bridge Antiques Centre is due to re-open in new premises and is planning a party in St George’s Square, and the owner Trish Banyard has found local businesses are keen to provide items for the party, including a Jaguar e-type! Mike from The Print Bureau has offered to provide leaflets and banners free of charge to flood-affected businesses, and Trish has made great use of this on her old premises. Companies that would normally be in competition with other have also provided practical help to support the businesses in their trade. Not only did staff and owners from many other coach and minibus companies across Shipley, Brighouse and Batley help with the clean-up of the yard at Brighouse-based Arrow Coaches, immediately after the floods, Station Coaches from Batley are still loaning coaches to them, as owner Julie continues negotiations with her insurance companies, before she can replace her damaged vehicles. As some businesses won’t have premises for a few weeks yet, several pop-up shops have emerged, to enable them still to trade. The Egg Factory on Victoria Road in Hebden Bridge has opened its doors to many retailers on Saturdays and Sundays, allowing shops such as RubyShoesDay and The Heart Gallery to continue to serve its customers. Dubbed ‘Hebdenhams‬’ it has been hailed as a great success, and the local markets have also now been offering market stalls to some other traders to take similar advantage of. Brocante Homeware reopened its doors last Saturday, and the owner, Ruth, explained that, whilst she has tackled most of the repair and restocking with the help of friends and family, the wider community support has been invaluable. “Whilst working on the shop there has been a constant stream of well wishes. Some just gave a simple thumbs-up through the window, while others came in to see the progress and wish us well. “Many came back in on opening day, and enthused at the ‘new look” shop and some bought, placed sewing orders or enquired into curtain/blind making. So it was a good first day,” she said. One month on, and after the initial swell of hundreds of volunteers helping with the cleaning and sorting immediately following the floods, it can be seen that the community continues to rally around, and no more so for the businesses who are once again reopening their doors in the towns around Calderdale.